PSSI Global Services is ready for some football! It’s the last week of preseason NFL and the first weekend of college football. What a time to be alive! The gridiron action started early this week. Steve Hagerty and K18 were at Ford Field in Detroit, Michigan, when the Cleveland Browns faced the Detroit Lions. Mike Lemieux and C24 were at Heinz Field in Pittsburgh, Pennsylvania, when the Carolina Panthers faced the Pittsburgh Steelers. John Poss and K17 were at NRG Stadium in Houston, Texas, when the Dallas Cowboys came to town to battle the Houston Texans. Rick Kolinek and K22 are back in Rick’s real hometown, and he was at Soldier Field Thursday when the Buffalo Bills took on the Chicago Bears. Ron Ford was just down the road at Arrowhead Stadium in Kansas City, Missouri, with K26 when the Kansas City Chiefs hosted the Green Bay Packers. Marty Smitherman and K38 were at Raymond James Stadium in Tampa, Florida, when the Jacksonville Jaguars traveled to Tampa Bay to face the Buccaneers. Blake Blomstrom brought C31 to Lincoln Financial Field in Philadelphia, Pennsylvania, when the New York Jets took on the Philadelphia Eagles. Wes Hill and CK35 were at Levi’s Stadium in Santa Clara, California, with help from Chris Hovden when the LA Chargers faced the San Francisco 49ers. Ray Loyko headed up to CenturyLink Field in Seattle, Washington, with DC9 to meet up with David Meyer and K20 for coverage of the Oakland Raiders facing off against the Seattle Seahawks. And college football started off right on Thursday night. Rick Ball helped Nick Ray set up C41 for a 10-channel at-home transmission from Rentschler Field in East Hartford, Connecticut. This was for ESPN’s coverage of the UCF Knights versus the UConn Huskies. 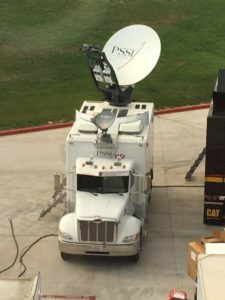 John May and CK48 truck were at Boone Pickens Stadium in Stillwater, Oklahoma, on Thursday when the Missouri State Bears took on the Oklahoma State Cowboys. This is the first of many Fox football games for John this season throughout Texas and Oklahoma. From Stillwater, John moves just up the road to Memorial Stadium at the University of Oklahoma in Norman. Florida Atlantic University is in town to battle the Sooners. Next week John’s right back in Oklahoma for more Sooners action on Fox. We’ve got a Friday night game, and it’s big for us: it’s the 4K broadcast of the Stanford Cardinal hosting the San Diego State Aztecs, live from Stanford Stadium. 4K guru Rick Varney has been working extensively with Fox to develop optimal parameters for a season’s worth of 4K games across the country. Joe Cox and C47 are parked right beside Rick’s truck to provide a 4K/HD transmission of their own. 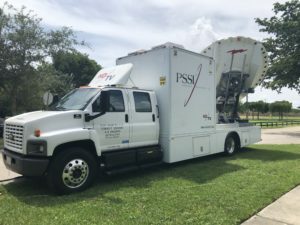 It’s going to be a big year for 4K, and PSSI Global Services is glad to be leading the charge! We’ve got even more Fox football this week, as well. Todd Harvey and CK25 will be at Memorial Stadium at the University of Nebraska in Lincoln when the Akron Zips take on the Nebraska Cornhuskers. Meanwhile, Wes Hill and Chris Hovden left Levi’s Stadium and headed to California Memorial Stadium in Berkeley, where the North Carolina Tarheels face the California Golden Bears. They’ll be using both antennas on the CK35 mobile teleport for what’s sure to be an exciting game. On Saturday, we kick off week one of the biggest college games on television: the SEC on CBS. John Bright’s at the helm of C12 at Bank of America Stadium in Charlotte, North Carolina, where the Tennessee Volunteers take on the West Virginia Mountaineers in the first of many SEC football games on our schedule. Just up the street from John, Steve Toth is with C32 (with some help from driver Dale Fountain) for ESPN’s special coverage of the SEC Nation kickoff festivities. Steve’s all set up at Romare Bearden Park, and he’s ready for early morning broadcasts on game day (and all day Friday) for all the hoopla surrounding the big game. We have ourselves a big game down in Miami at Riccardo Silva Stadium, where the FIU Panthers are hosting the Indiana Hoosiers on Saturday afternoon. 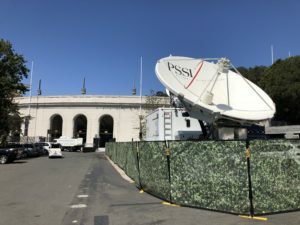 Out in the TV compound, senior engineer Rick Ball and at-home veteran Justin Roszak are setting up a groundbreaking transmission scheme for our friends and partners at CBS Sports. The guys are transmitting 14 multiplexed paths via satellite to the PSSI International Teleport (PIT). Our team at PIT then puts the massive signal on the AT&T global video network for direct delivery via fiber into CBS headquarters in New York City, where their production team will produce the game. Rick and Justin are pushing an unprecedented amount of data via satellite with minimal latency in what will soon be the industry standard for at-home productions and transmissions. Thanks to all of our guys and our colleagues at CBS for pushing the technological envelope. Exciting things to come this season! Dave Mitchell will be at Highmark Stadium in Pittsburgh, Pennsylvania, when the Shippensburg Red Raiders face the Clarion Golden Eagles. Mike Sheehan is bringing NT30 to War Memorial Stadium in Laramie, Wyoming, when the Washington State Cougars battle the Wyoming Cowboys. We’re even doing football in Canada! David Meyer will be at Thunderbird Stadium in Vancouver, British Columbia, when the University of British Columbia Thunderbirds face the Manitoba Bisons. And why not get some high school action in there. Before his college game, Dave Mitchell will be at South Fayette High School stadium in Pittsburgh, Pennsylvania, with the Arizona truck when the Beaver Bobcats face South Fayette Lions. And Chris Golden and the Frontline truck are parked at Lobo Stadium at Longview High School on Friday when the Lufkin Panthers face the Longview Lobos. In other news, we have a strong presence at two sad, but uplifting, historical events. PSSI News Group’s Scott Garber, Dustin Tanner and Cary Poarch are working long hours to bring the world images from John McCain’s funeral via CNN. 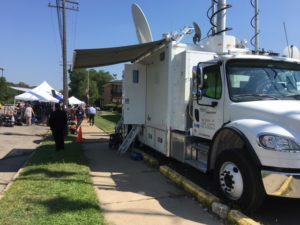 And, in Detroit, Steve Mills is live all day for CNN’s coverage of Aretha Franklin’s funeral. As if that weren’t enough uplinks for one company, we’ve also got some MLS on the schedule. Dennis Smith and NT21 were at Audi Field in Washington, D.C., on Wednesday when D.C. United faced Philadelphia Union. Mike Howley is at TPC Boston in Norton, Massachusetts, with C42 for the Dell Technologies Championship with a purse of $9 million. Kevin Spangler and C45 are having a busy weekend in Myrtle Beach, South Carolina, for the 2018 World Amateur golf tournament. Dave Brin and C49 are still up north at Canyon Meadows Golf & Country Club in Calgary, Alberta, this week for the Shaw Charity Classic. C15 headed to Portland, Oregon, with Steve Chaisson. Steve’s at the Columbia Edgewater Country Club for the LPGA Cambia Portland Classic. Benny Griffis and C43 are at Canterbury Golf Club in Beachwood, Ohio, this week for the DAP Championship, just one stop on the Web.com Tour with a prize purse of $1 million. After high school football, Chris Golden and the Frontline continue on to Thackerville, Oklahoma, to the WinStar World Casino to set up for coverage of the long-awaited Volvik World Long Drive Championship. CK30 and engineer Nick Ray were at Scotiabank Arena on Monday for WWE Raw, where highlights included Seth Rollins defeating Kevin Owens and Braun Strowman and Roman Reigns agreeing to a tag match with Dolph Ziggler and Drew McIntyre during the upcoming Hell in a Cell show. The group continued at Scotiabank Arena on Tuesday for WWE SmackDown where Charlotte defeated Carmella in the Women’s Championship, making her the number one contender for Hell in a Cell. Then driver Joe Kelderhouse grabbed the truck and headed back to the States for next week’s shows in Columbus, Ohio, and Detroit, Michigan. 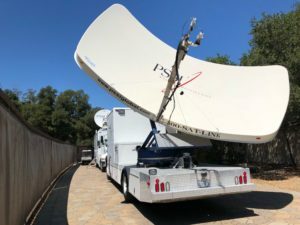 While all of these uplinks are going on across the country, our shops in Los Angeles, Vegas and Orlando are working furiously to upgrade the newest members of our fleet as well as provide preventative maintenance to some of our workhorses. 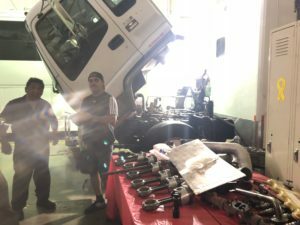 In this photo, father-and-son team Rafael and Alex Mestizo, with some help from Jose “El Gordo” Sanchez, are doing an engine overhaul to ensure the truck will roll another 300,000 miles to provide our customers with top-shelf transmission services. We wish all of our shop crews — as well as everyone working so hard in our company, our clients and our families — a happy Labor Day!